← Happy chocolate ice cream day! or a substitute for Ipacac. Normally, I’m a Lindt fan, but here’s where I draw the line. Apparently I am not a huge fan of total cocoa, either….I admit it, I just don’t understand the challenge of “enjoying food”. If it doesn’t taste good after the 3rd bite, I can move on. My apologies to all the food traveler t.v. shows, I’m just not as cool as you. Now, there are things that I love which make others cringe such as oysters, and gin martinis (not together, of course), so my palette isn’t completely juvenile. This dark, dark, chocolate bar is shiny, and thin, with a good snap as you break apart the tiny piece which is about to sear into your tongue. The wrapper comes complete with directions for optimum eating enjoyment. This should serve as a warning, you never should need instructions when eating candy! 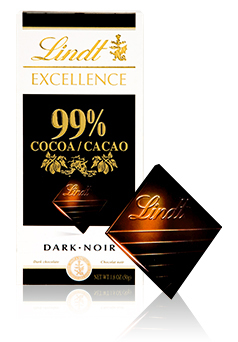 we recommend that your progressively develop your palate through our range of high cocoa content chocolate bars, starting with Excellence 70%, then Excellence 85% and finally 99%. Or wash it down with a fifth of jack so that you can forget that you ever were so silly as to buy bakers chocolate with a marketing spin. This 99% is not eaten by 99% who occupied Wall Street. In fact, I doubt it’s eaten by .005%. But, if you enjoy it…good for you, you’re a better man than I! * Many thanks to my brilliant sister, Eleanor, who discovered this dark chocolate silliness, and wrote much of this post. Posted in Dark Chocolate, Don't bother and tagged cocoa content. Bookmark the permalink.